Wired Cat Ear Headphones. You saw them on Indiegogo and fell in love at first sight. Now you can get your own pair right here! Enjoy your music privately--or turn on the cat ear speakers to share with friends LED accent lights on cat ear speakers and earcups make a statement anywhere Speakers and lights are controlled independently Over-the-ear cushioning for noise reduction and a secure fit USB rechargeable--up to 5 hours of playing time per charge Detachable gaming boom mic Inline volume control plus forward & back buttons Listen privately or share your music with your friends. Slip the cushioned earcups over your ears and they conform the unique shape of your head, blocking out background noise and letting you enjoy all the rich, vibrant sound you expect from premium headphones. But that's just the beginning. With the flip of a switch, your headphones go from private sound studio to a party-rocking sound system everyone around you can enjoy as your music pumps through the external cat ear speakers. These headphones look as great as they sound. 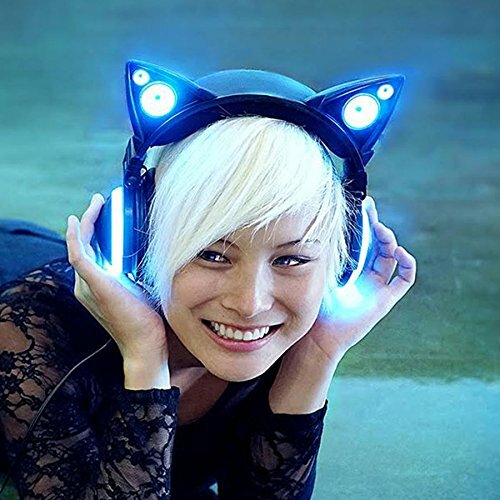 The headphones you wear make a fashion statement, and these Cat Ear Headphones make one of the coolest there is. Their distinct shape and prominent cat ears are accented by bright LED lights that can be controlled independently from the speakers. Light 'em up to suit you mood, your wardrobe, or just because you can. Gamers, meet your new favorite headset. When it's time to make the switch from music to gaming, Cat Ear Headphones have you covered. Simply plug in the detachable boom mic and you've got the coolest looking headset around. Game on! Headphone Audio 20Hz-20KHz frequency response 32 Ohm impedance 40mm drivers Cat Ear Speaker Audio 200Hz-18KHz frequency response 4 Ohm impedance 32mm drivers What's In the Box Cat Ear Headphones Detachable gaming mic 4' detachable headphone cable (3.5mm) USB recharging cable Protective carry case Get your paws on the Indiegogo sensation.